If we are asked which feature we'd like improved on current smartphones, apart from the obvious contender battery life, we'd answer screen brightness. Average pixel density we can live with, but the brighter the display the less annoying its outdoor usage, especially if you have that old yellow star shining directly on your phone's screen while you are trying to quickly look up a contact, or check a website. 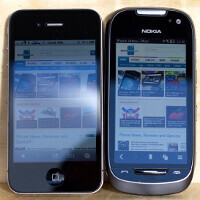 The Nokia 701 manages to cram in the brightest screen on a mobile phone to date, which, with its 1000 official nits, is almost 50% easier to see outside than the LG Optimus Black, for example, with its 700 nits, or the previous champion Nokia E6 with its 900 nits. The E6 excels in pixel density, though, with its Retina Display-like 325ppi. Now let's cut to the chase and examine this sweet 3.5” LED-backlit IPS-LCD display on the Nokia 701, with 360x640 pixels and the ClearBlack technology, which manages to shine like a crazy diamond with 1000 nits of brightness. In short, having a stronger backlight, or whatever other trick the screen manufacturer is using to make the display brighter, is great outside. Compared to some other phones we put it next to in the sunshine outdoors, it was way more visible at full throttle. 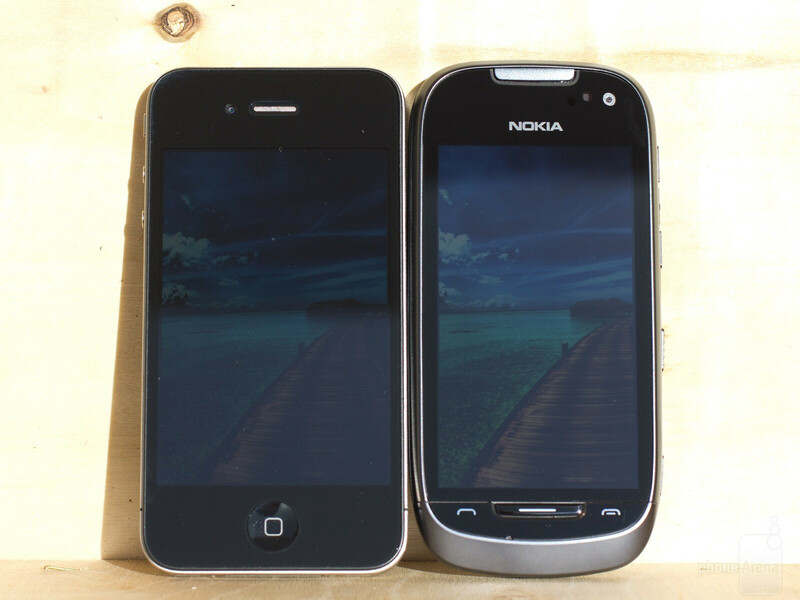 To put things in perspective, we compared the Nokia 701 outside with the Apple iPhone 4, which can hit peak brightness of about 600 nits, not shabby at all, and the Samsung Galaxy S II, which goes up to around 400 nits. Nokia says that due to the ambient light sensor the effect on battery life is minimal, as you won't always have the screen at peak brightness, but it's good to have a luminous display when you need it, and we tend to agree. Our unscientific test showed that running an HD movie at full brightness claimed about 30% more juice out of the battery than at average luminousity, but that can be said for most other smartphones as well. As you can see on our improvised outdoor setup, comparing the Nokia 701 1000 nits to the iPhone 4 and Galaxy S II at maximum brightness, the difference in visibility is discernible even on pictures and video, which sport some reflections from clouds passing by, and in reality it is even more visible. 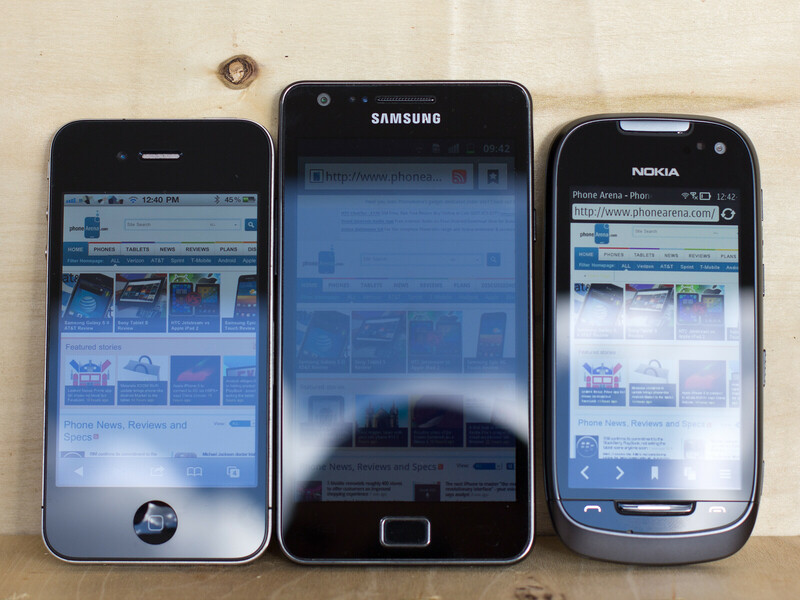 The worst performer was the screen on the Galaxy S II, which is saved only by its very low reflectance ratio outside. It's not necessarily a feature inherent for the AMOLED tech, since the Nokia X7 hits about 700 nits, for example, although the lack of backlighting with OLED displays probably plays a role somewhat. What do you think, is increased brightness on your wishlist for the next generation of mobile displays, after we get past the resolution craze? Samsung releases 1.5GHz Exynos dual-core processor and 16MP CMOS camera for mobiles. Nokia may be need this to supporting the screen brightness. I don't understand, are you trying to compare some high end smartphone from Samsung to a mid range smartphone by Nokia? I would still take the galaxy s 2 and iphone over that anyday. Yeeee: again you don't seem to get the point. The Nokia 701 is a cheap (about 250 euro) device compared to a 500 euro (and more) phones. This week with the FREE OS upgrade that device got even MORE value for money with it's free 1.3GHz performance increase which is NOT bad and a hugely improved Nokia Belle FP1 OS (we don't call it Symbian no-more) The 701 is undeniably a bargain. And ppl are stupid not to get one, just for the fun of it. CMOS sensors seriously !!! now get this straight u need some good lenses first, to produce 16 MP of pic quality to be used on that sensor . Now Google the company having best smartphone camera in any segment . I'll bet that much less expensive Nokia beats that very expensive Samsung in battery life too. I just saw an article by someone who said he was sorry he bought a Samsung and wished for the Nokia now. Sometimes it's very expensive to learn. who the F would want a pos Nokia over the GS2? Doesnt mean that GS2 has better specs than a cheap Nokia also means that its better in every aspect. I'll bet my a$$ that my 6 year old Nokia 5810 has 3 times the battery life of your GS2. your phone has better battery life, okay now lets show what the GS2 has better. Bigger wider screen, much faster processor, better camera, way better web browser, better music player, better app store, better features, thinner, better looking, etc etc etc So yes you enjoy your battery life that probably only lasts an hour more at most and i'll enjoy everything else. I would. And I bought one. You should too. It's a bargain at 250 euro. You get a phone with a great screen (as illustrated above). Full bluetooth transfer and syncing, Fm-radio AND transmitter, 7GB internal storage+SD-card expansion, it's the only smartphone with full 2-way call recording, can be used as a BT/USB-thumbdrive or USB-modem. And Nokia Maps & Drive is fantastic. It integrates seamless with the Nokia adressbook and calender. And it can be synced over USB (I know it's trivial but many newer phones can't) without the need for expensive data-plans and clouds. Like I said. It's a bargain and everyone should get a 701, even just for the sake of it. Maybe a brighter and brighter display is not necessarily the way of the future. But somehow using ambient light to increase screen visibility will take over. I know some company tried to do that, but I guess it never took off. We'll need some screen cover by 3M that re-directs ambient light into the backlight. Put your thinking caps on people! Transparent displays where you hold your phone against the sun and the sun becomes your back light. How many nits is the sun? May be iphone5 could have better ppi. Stop day dreaming dude, wipe your saliva. Seriously why do iFags tend to day dream about the iPhone getting better specs when they see another phone with greater specs. Probably because you already know that you iPhone is inferior. Get over it. That makes one of us. Is rather have a legible display in sunlight than one of high res (over 300 ppi). But yore right on battery life. Me to, although brightness is next in line from the two you mentioned. I seldom view videos and photos in direct sunlight, so at present I still dont need that much brightness. . . Yes you do. Because when you TAKE that picture it's usually in daytime preferably well-lit scenes. Since well-lit environments are best on these phone-camera's as is prooven on every review regardless of the phone-brand or -preference. I want a phone that doesn't give light by darkness, but you can still see whats on your screen, you know what i mean? Sinse I got my HTCs and gave up the Amoled screen on my Nokia C7 I was quite shocked on how terrible the super LCDs were in comparism. You can't deny that while Nokia may have issues in other areas of their phones they make the best screens of them all. Best screen I've ever used on phone came from Nokia E7. 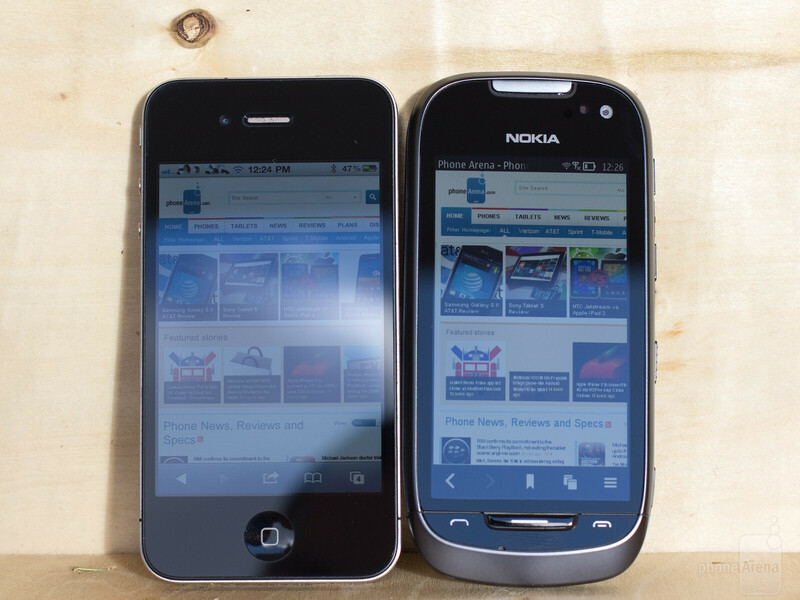 both nokia 701 & iphone 4 has 3.5in screen. then why it looks the iphone screen is bigger than that of 701? it must be the same, right? did you guys notice that? Idon,t know why this site against gsm arena don,t like sony ericsson phones.the best screen i have seen are from ray and arc specialy ray.with high density and reality display with bravia.every thing in xperia ray and arc are very real and cool bright in very beautiful design.